The most widely available measure of underemployment is the share of involuntary part-time workers in total employment. This column argues that this does not fully capture the extent of worker dissatisfaction with currently contracted hours. An underemployment index measuring how many extra or fewer hours individuals would like to work suggests that the US and the UK are a long way from full employment, and that policymakers should not be focused on the unemployment rate in the years after a recession, but rather on the underemployment rate. The most widely available measure of underemployment estimated by statistical agencies around the world – such as the Bureau of Labor Statistics in the US, the Office for National Statistics in the UK, and the EU statistical agency Eurostat – is the share of involuntary part-time workers in total employment. This measure only captures the number of part-time workers that wish to extend their hours. It carries no information on the number of additional hours these workers wish to work, nor if some (other) workers, including voluntary part-timers and full-timers, would prefer to reduce their hours. However, the widespread use of this measure of underemployment reflects the lack of alternatives, particularly in the US. In Europe, involuntary part-timers are described as part-timers who want full-time jobs (PTWFT), whereas in the US they are described as part-time for economic reasons (PTFER). In Europe, statistics on PTWFT are obtained from the individual level European Labor Force Surveys (EULFS) and in the US on PTFER from the Current Population Survey. We treat these measures analogously. 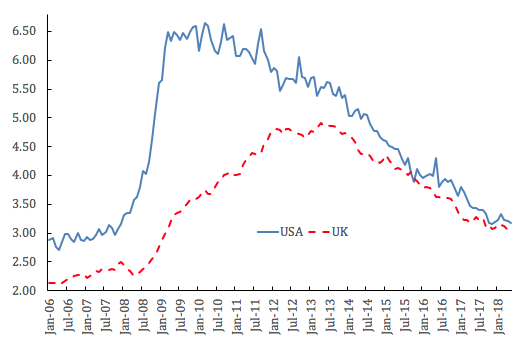 Figure 1 plots the involuntary part-time measure as a percent of total employment that we call U7 for both the US and the UK. The most recent UK rate of 3.0% for May 2018 remains above pre-recession lows of 2.3% found in May 2008 and the historic low of 1.9% found in six separate months in 2004 and one in 2005. The US rate in August 2018 was 2.8% below the December 2007 rate of 3.2% but above the series low of 2.3% found in seven separate months in 2000. The question remains how low the involuntary part-time rate can go without generating rapidly rising wage pressure. Measuring underemployment using the involuntary part-time rate does not fully capture the extent of worker dissatisfaction with currently contracted hours. It turns out that over the Great Recession years and subsequently, not only do part-timers who say they would prefer full-time jobs want additional hours, but voluntary part-timers and full-timers do too. Indeed, some voluntary part-timers and full-timers say they want fewer hours. The numbers of additional hours of those who wanted more rose over time and the number of hours who wanted less, fell in the downturn, only to reverse those trends during recovery. In the EULFS, workers report whether they would like to change their hours at the going wage rate and how many extra or fewer hours they would like to work. A desired hours variable can thus be constructed for each individual. It is set to zero for workers who are content with their current hours. It is negative for those who wish to reduce their hours (the overemployed) and positive for the underemployed who want more hours. The data are nationally representative and hence we sum them into millions of hours and deduct the number of hours of those who want less hours from the number that want more to generate a measure of excess hours. We translate it into unemployment equivalents by dividing by average hours worked by the employed. Figure 2 shows our estimates for the UK of the number of desired hours of those who want more hours (the underemployed) and those who want less (the overemployed) at the going wage. The latter series was broadly flat until recently but was always above the fewer hours series before 2008. That suggests there is still a good deal of under-utilized resources in the labour market available to be used up before the UK reaches full-employment. 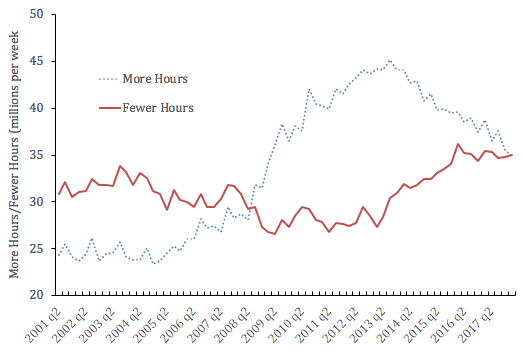 There has been a rise both in the number of hours of those who want more hours and those who want less in the post-recession years. Table 1decomposes the net variation in aggregate desired hours – which deducts the number of hours the overemployed desire from the number the underemployed desire – into components from voluntary and involuntary part-timers, and full-timers using the EULFS for 2016. Our paper reports estimates, for other years and additional European countries. It is clear that the extent to which IPTR is a biased estimator of the extent of labour market slack in the period after the Great Recession varies by country. In France 27% of the excess is due to involuntary part-timers versus 99% in Italy. We explore the issue of underemployment reducing wage pressure further for the UK, an international panel of 31 countries as well as for the US where we only have data on PTFER available. In the case of the UK we found that wage growth was significantly lowered, in a quarterly regional panel by an underemployment measure, the log of the number of additional hours the underemployed would like. The unemployment rate was insignificant. In an unbalanced international panel of 28 countries from 1976-2016 we found that involuntary part-time employment lowered wage growth confirming IMF results using these data from Hong et al. (2018). We then examined wage growth in the US using wage data from the Merged Outgoing Rotation Group files of the Current Population Survey from 1979-2017. Consistent with the findings of Blanchflower and Oswald (1994), we found that for the period 1980-2017 the unemployment rate enters negatively in a wage growth equation. However, in the years since the Great recession the unemployment rate was insignificant, but an underemployment measure (U7) – PTFER as a percent of employment – was significantly negative. This was true whether weekly or hourly earnings were used. In contrast to the unemployment rate (U3), the U7 variable still remains elevated and predicts weak wage growth. We also find evidence that the change in the home ownership rate enters significant and positive in wage growth equations. In the years that we have data for from 1985 through 2005, 16 years had positive changes. From 2005-2016 all were negative and 2017 was positive again. A rising home ownership raised wage growth in the pre-recession years; falling home ownership rates lowered wage pressure in the pre-recession years. It seems the US and the UK are a long way from full employment. Policymakers should not be focused on the unemployment rate in the years post-recession, but rather on the underemployment rate. The underemployment rate remains elevated in many countries in contrast to the unemployment rate. Declining home ownership has also helped to contain wage growth. Underemployment replaces unemployment as the main measure of labour market slack in the post-recession years. Bell, D N F and D G Blanchflower (2018), “Underemployment and the lack of wage pressure in the UK”, National Institute Economic Review 243(1): R53-R61. Blanchflower, D G (2019), Not Working: Where Have All The Good Jobs Gone?, Princeton University Press, forthcoming. Hong, G H, Z Kóczán, W Lian and M S Nabar (2018), “More slack than meets the eye? Recent wage dynamics in advanced economies”, IMF Working Paper /18/50. Jowett, A, C Taylor, M Hardie, and Z Khan (2014), “An International Perspective on the UK – Labour Market Performance”, ONS, January. See also Bell and Blanchflower (2018) for the UK and Blanchflower (2019). In Bell and Blanchflower (2019) we report that 13% of workers are part-time, defined as working less than 30 hours a week, versus 37% in the Netherlands; 24% in the UK; 22% in Germany 19% in Italy; and 14% in France.